I have been posting too much unhealthy stuff lately. So, here is something good for you. And I am sorry the paragraphs are off, blogger would not let me do it right. One of the things that I am trying to work on, because I feel it is very important, is teaching my girls to cook. Yes, they know how to help me in the kitchen, but I think they are both old enough to really start cooking with me. They can learn so much by following a recipe and cooking. Plus, it is good way to spend time with each one of them individually. I also am hoping that it will help them enjoy some of the more healthy things that I have been making. Most kids will eat what they make. So, maybe if we make some healthy things together, it will help them enjoy eating them more. At least that is my hope. After the holidays I hope to start posting more of the recipes that the girls and I make and some of my tips for cooking with kids. I think I will turn it into a weekly feature. That would give me some motivation. If I am posting about it regularly, I will be more motivated to cook weekly with each of them. Today, I want to post a recipe, that my eight year old, G and I made this week. G loves carrots. She can eat a lot of carrots. She loves just about anything that contains carrots, so when I saw this recipe I knew it was one that I wanted to try. As soon as she found out they had carrots in them she was thrilled to help. One of the things I like about a recipe like this, is that there is a lot a child can help with. Let them peel and grate the carrots, my kids love to do those two jobs. This recipe is also mixed by hand, which makes is a great kid recipe. I helped her stir it at the very end, but she was able to do the majority of the work. We had a lot of fun making these and they were really good. 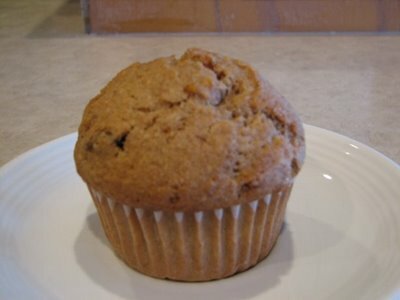 I will be making these muffins often. They are really good and also healthy. They will make a good addition to our breakfasts and snacks. You will enjoy these even if you do not have an 8 year old to help you make them. The recipe came from King Arthur Flour, for the original recipe see here. ( King Arthur has some great recipes on their website) I made it a little healthier by using whole wheat, so here is my version. Preheat the oven to 400°F. Lightly grease a standard 12-well muffin pan. Or line the pan with paper muffin cups. 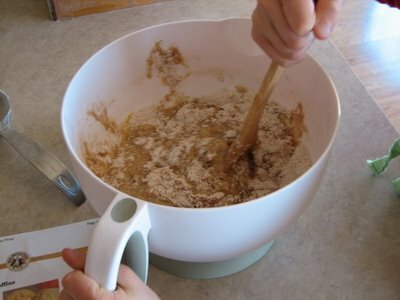 In a bowl whisk together the dry ingredients, including the raisins and nuts. In another bowl, whisk together the eggs, water, and oil. Stir the wet ingredients into the dry ingredients. Fold in the grated carrots, stirring to combine. 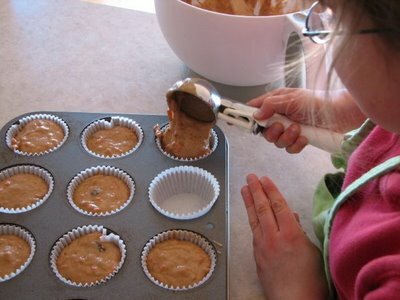 Divide the batter among the muffin cups, filling them quite full. Bake the muffins 18-20 minutes or until a toothpick inserted in the center of one comes out clean. Those look good! 🙂 My kids enjoy eating things they’ve helped make too. I’ve never thought to use an ice cream scoop for muffins, but that is an awesome idea! I usually just use a spoon and it ends up being messy. I agree with your daughter about carrots. They are just about my favorite food. I like King Arthur recipes too. These muffins sound great. Excellent choice, carrots are so versatile and healthy. Look out for the coloured ones too! Lots more intersting recipes in the World Carrot Museum. We should all eat more carrots!